I’m always on the lookout for premium, homemade tortillas. San Antonio Texas is home to thousands of taquerias each with a mujere in the back quietly rolling or pressing out scratch tortillas by the hundreds. Just another good reason to visit one of the great cities of the American Southwest. La Bandera Molino takes their tortilla production very seriously. To wit; they are a molino or mill. This is a facility where truckloads of corn are delivered, ground, converted into masa then pressed or rolled into tortillas. Big truck loads of Texas grown corn come in the back door. Big boxes of fresh tortillas go out the front door. Simple. We’d give anything to have a place like this in Austin but sadly, we have to drive to San Antonio to experience this level of cookery. Click on the San Antonio icon to your right and you can read a review of the food at La Bandera Molino. It is very good. This entry was posted in San Antonio, Texas Daily Photo, The Foodist. Bookmark the permalink. There used to be that factory on 5th St. (was it El Milagro?) that had a retail shop in a corner of the factory building where you could get freshly made tortillas and chips and masa so fresh it was still warm from the grinding machinery. Long time ago they moved the factory south of the river and did not continue the on-site retail shop. Phooey! 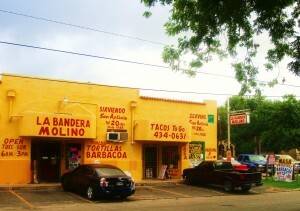 Not sure how often you find yourself in San Antonio Jim but La Bandera Molino is out of this world good. Get the fried pork chops with huevos divorceados and a pound of barbacoa to go. Thanks, RL. I’m going to boogie down to San Antonio soon to catch the jade exhibit at the SAMA and will definitely follow up on this tip. Sounds mighty good.